The competition is open to secondary school pupils, who are currently enrolled in secondary schools in European States. Teams must have two pupil members and one teacher. The 15 finalist teams will be invited and financially supported to attend the summer school in Budapest, Hungary. No more than one video submission per team can be considered. Each submission should be a filled out and signed registration form (Form1), provided as a scanned PDF file (template available on the ENEN website in DOCX file), should contain the data of the team members (pupils’ names and date of birth, accompanying teacher’s name and official title in the school, school’s full address) and a short description of team work. Teams are required to send a link to their videos in an e-mail rather than sending them attached. (a) A video of maximum 3 minutes on one or more of the four nuclear disciplines (see suggested topics). Videos in a language other than English must have English subtitles. (b) Free of copyrighted materials such as music, images and video clips that may violate or infringe upon the copyright of any other person or organization. It is the responsibility of the participants and not of the ENEN to ensure that all contents used in the project is free from copyright. By submitting the competition material, participants agree to assign to the ENEN the copyright to publish the video or digital media presentation on the ENEN website, social media and other platforms and certify that no other rights have been granted which could conflict with the right hereby given to the ENEN. The deadline for submission of registration form and video is 1st March 2019 midnight (CET). Submissions received after this deadline will not be considered. After the submission of the video, no further modifications are allowed. If an infringement of copyright is notified at any stage of the competition, the team will be immediately disqualified. 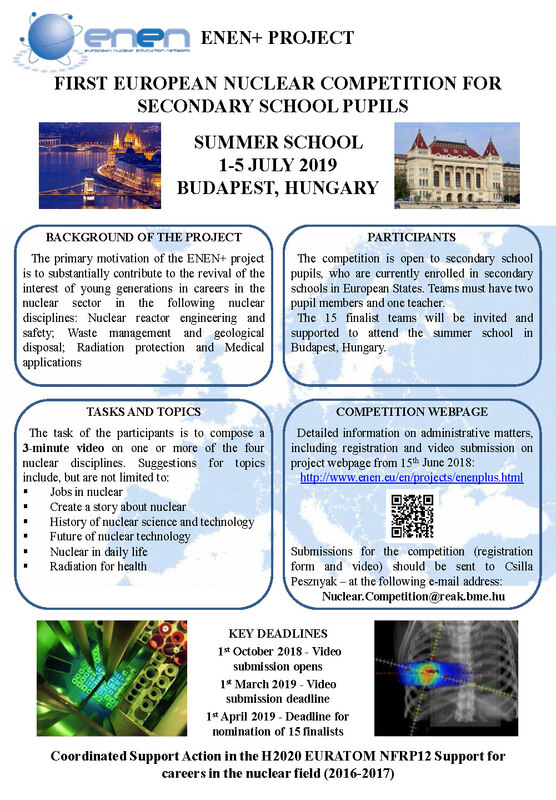 Fifteen teams (composed of two students and one accompanying teacher per team) selected by the ENEN+ as finalists will be given the opportunity to present their project live at the First European Nuclear Competition and Summer School in Budapest, Hungary, on 1-5 July 2019. The deadline for nomination is 1st April 2019 midnight (CET). The deadline for the submission of required documents is 20th April 2019 midnight (CET). Submissions received after this time will not be considered. An international jury will select the winning team. The General Data Protection Regulation (GDPR) (EU) 2016/679 is a regulation in EU law on data protection and privacy for all individuals within the European Union (EU) and the European Economic Area (EEA). With the implementation of GDPR, 25th May 2018, any time personal data is collected on an EU citizen, explicit and informed consent has to be given from that person for the specific purpose for which the data was intended. The regulation aims at strengthening data protection and further harmonizing data privacy laws across the EU, enhancing the rights of individuals regarding their personal data. 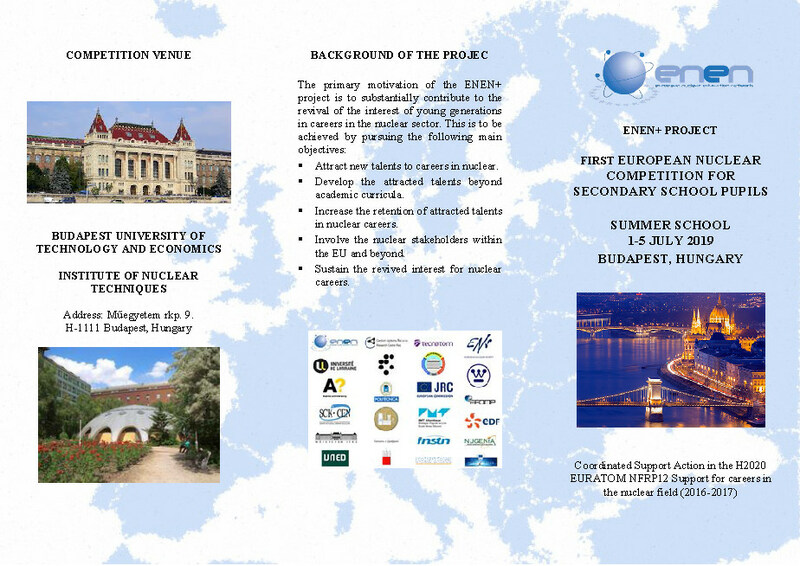 In order to ensure the appropriate coordination and smooth organisation of our events, ENEN would like to ask pupils, teachers and parents to give their permission for ENEN to use the necessary personal details and possible images (including any audio-visual motion picture and still photographs created during the events) within the frames of and for the purposes of the European Nuclear Competition for Secondary School Pupils and the summer school in accordance with the EU General Data Protection Regulation (EU 2016/679). The indication of approval must be signalled on the registration form and (for selected teams) the parental consent document.